Used Audi Q5 Review - 2008-2017 | What Car? 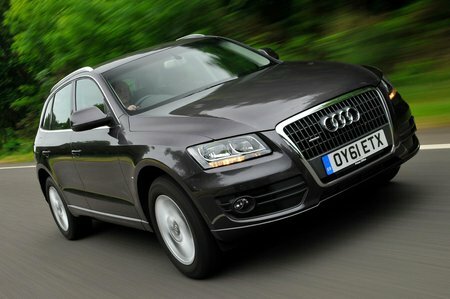 What's the used Audi Q5 4x4 like? As evidence of just how important SUVs have become to premium car makers’ balance sheets, consider this: Audi’s best-selling car worldwide is not the A3 hatchback or even the A4 saloon, but the Q5. This is the first-generation version of the mid-sized SUV and it arrived in dealerships in 2008, since when more than 1.6 million have been sold. It went bumper-to-bumper with the BMW X3, Volvo XC60 and Land Rover Freelander, and it makes do with five seats rather than the seven of Audi's larger Q7 sibling. It might come in many of its versions with Audi's fabled four-wheel drive 'quattro' system, but it doesn't really do serious off-roading, although it'll tackle the odd unmade-up country lane with aplomb. An engine range spanning petrol, diesel and four to six cylinders adds to the Q5’s draw and ensures prices have remained robust, along with the enduring appeal of Audi’s interior fit and finish. The 141 and 168bhp versions of the 2.0-litre diesel unit are the most popular, although there's a punchy 3.0-litre V6 diesel too. Petrol fans are catered for with a 2.0 TFSI four-cylinder unit, and the SQ5, a real humdinger of a car that adds sporty appeal to the SUV practicality. A six-speed manual gearbox is available on the two 2.0 diesels, with a seven-speed S tronic automatic gearbox offered as an option. This auto 'box is a standard fit on the rest of the range. There were three trim levels to choose from - SE, S line and S line Plus. Opt for the entry-level SE models and expect to find it is reasonably well-equipped with a 6.5in MMI infotainment screen, a 10-speaker sound system, a DAB radio, electric windows, three-zone climate control and cruise control all as standard. Outside the Q5 is shod in 18in alloys, a rear spoiler, and rear parking sensors. Upgrade to the S line trims and expect to find a sportier looking Q5, with bigger alloys, an aggressive body kit and xenon headlights all included in the package, while the range-topping S line Plus includes Audi's sat-nav system complete with a 40GB hard drive and parking sensors at the front. As you can imagine the SQ5 comes with its own bi-turbo 3.0-litre V6 engine, and comes in two trims - SQ5 and SQ5 Plus. The main differences include a far more aggressive body kit, quad-exhaust system, bigger alloys and a Nappa leather interior. Inevitably the Q5 is slower than a similarly-powered A4 thanks to its extra weight and height, but in real-world driving it feels brisk enough. On the road, there was the option of adjustable damper control and variable-ratio steering as part of Audi’s Drive Select package. Despite the elevated driving position and 1.8-tonne mass, the Q5 turns with remarkably little body roll and changes direction without protestation. Its steering is initially finger-light, but it weights up suddenly. Accelerate onto a roundabout and the change in assistance can catch you unawares. Town driving reveals another dynamic flaw: the ride is far too firm. The problem isn’t just larger potholes or speed bumps, which the suspension deals with without any problems, but also small to medium-sized intrusions. Even on a motorway the Q5 refuses to settle. The movements are not uncomfortable, and some of these issues were addressed with the mid-life update in 2012. Softer springs result in much less bouncy ride. The Q5's seats are accommodating, particularly if you find a car with the optional sliding rear bench; this allows you to trade up to 10cm of boot space for more rear leg room. Head room in the rear is also in good supply for two tall adults, although a middle-seat passenger will need to straddle a large transmission tunnel in the floor, which eats into their leg room. The Q5's boot is bigger than the Volvo XC60's but slightly smaller than the BMW X3’s, and as you’d expect of a car of this type, it has a flat loading lip and some useful underfloor storage. You can also fold the rear seats down if you need to carry larger items. 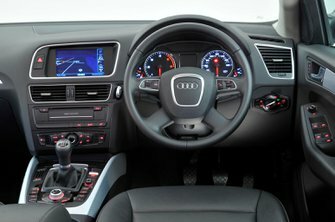 Up front, there are plenty of cubbyholes for odds and ends, and for the ultimate in luxury you might even find a Q5 that was specified with heated cupholders. A mid-life facelift in 2012 resulted in increased power outputs as well as stop-start becoming standard fit, thus reducing running costs.